These turtles are not in a hurry. They’re starting their migration to the nesting grounds, but they aren’t definitively swimming south yet. Asha, as you can see from her detailed track below, started south, and then looped up again back onto the shelf break. At this point, she is foraging on jellies as she travels and likely found a patch of them. We’ve seen leatherbacks do this many times before. Christie and Beverly have tracks that are a bit more unusual. Christie is still hanging out in the northern foraging domain. She hasn’t decided to head out yet. When she does, we’ll see her covering long distances relatively quickly. Right now, she is near the Virgin Rocks on the Grand Banks. The water there at this time of year is under the strong influence of the Gulf Stream, so is certainly warm enough for her. Beverly is particularly interesting. We’ve seen lots of leatherbacks head far to the east—almost to the African continent—before turning back west to the nesting grounds on this side of the Atlantic. 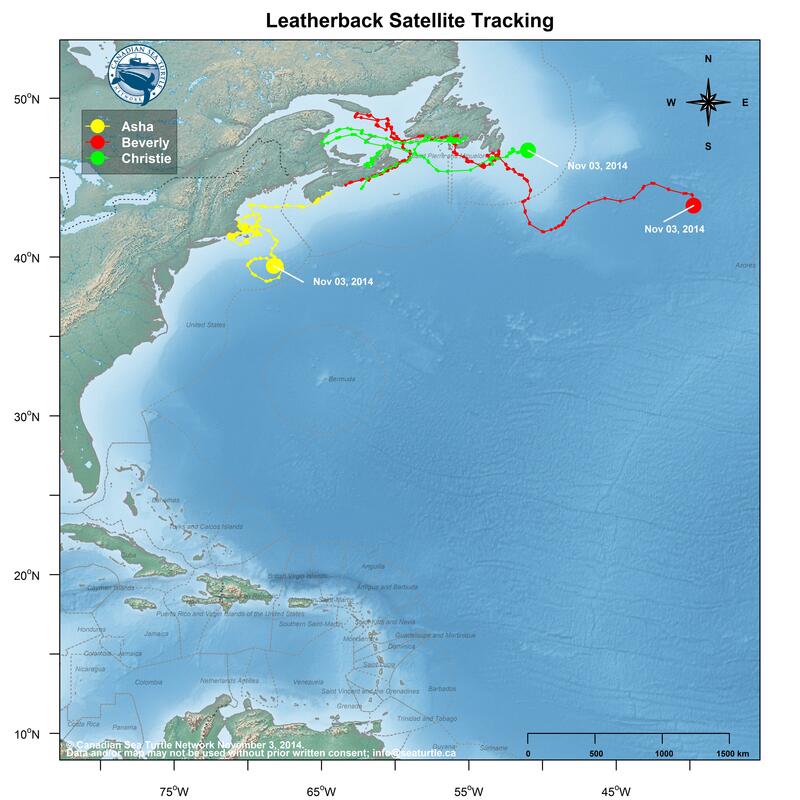 However, we’ve never seen a leatherback go this far east while at a latitude this far north. 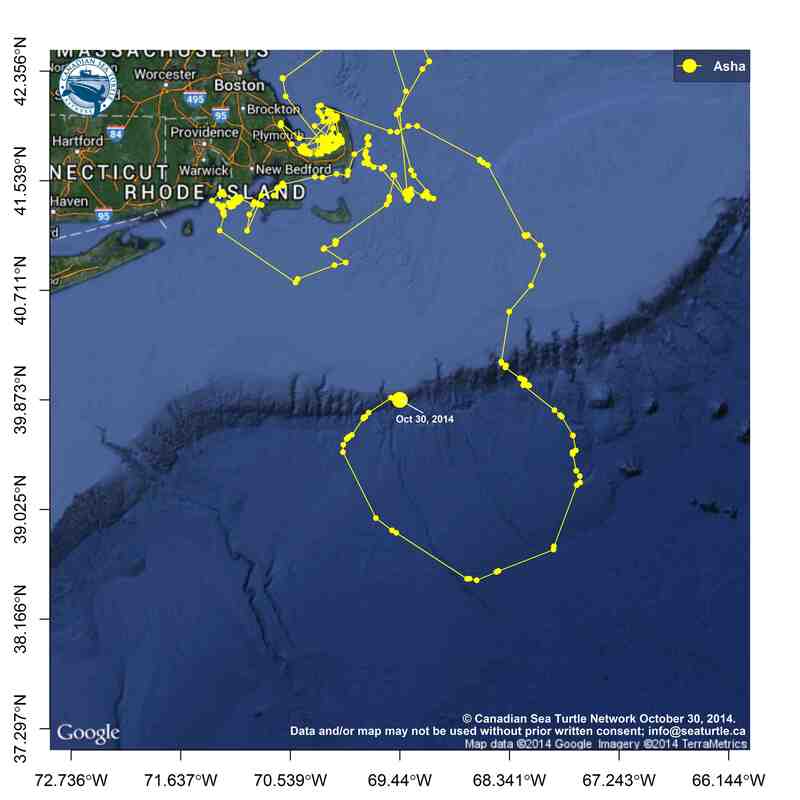 Beverly is 400 km southeast of the Flemmish Cap—in territory “our” Canadian leatherbacks haven’t covered before. This is one of the reasons I find satellite tracks of leatherbacks so fascinating. Although we’ve satellite tagged 86 turtles, there is always something new to learn. The leatherbacks surprise us.